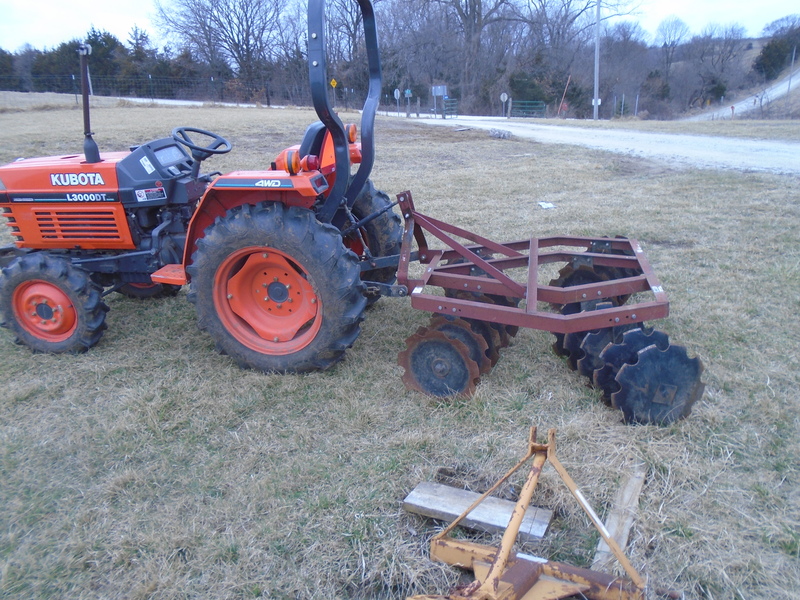 I recently bought this two bottom plow to put in our garden and to put in food plots for deer on our farm here in south central Iowa. I have been excited to finally get to use it so this past Sunday it was warm and dry and I thought I would plow our garden. Now remind you, I was raised in the city and never have done any farming whatsoever, so I was learning as I went. First thing I did was to hook up the plow to the tractor and that was no easy task. It took me almost an hour to get it hooked up. I learned when you set it down on the ground it is best if you put it on a level surface. I didn’t do that when I had taken it off the truck and set it down. 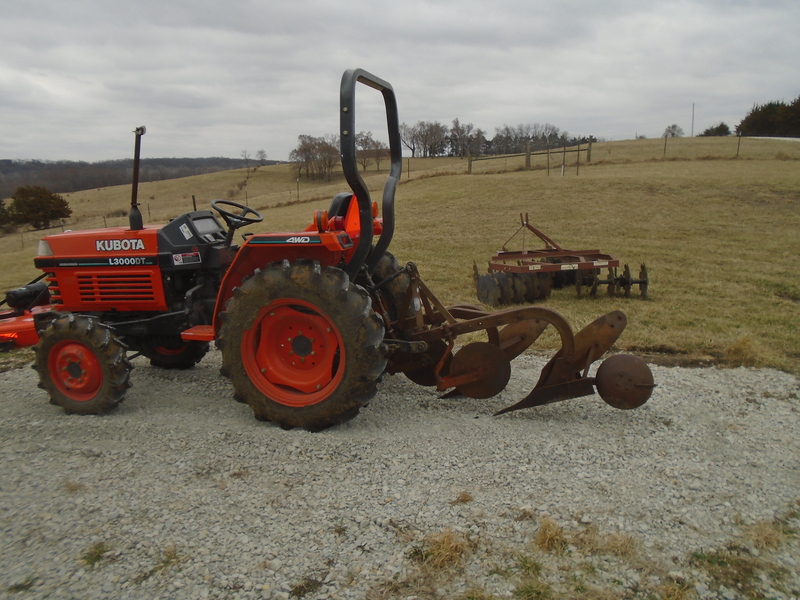 This plow probably weighs close to 400 lbs and once the plow tips sink into the ground it is hard to move it around to hook it up to the tractor’s 3-point hitch. So with much effort I was finally able to get it hooked up and hopefully next time I use it, it won’t take as long. Once I was able to start plowing it went pretty good. I wasn’t sure of the angle I needed to set the plow and did it the way that looked right. I must have got it right because it plowed very well, and my tractor pulled it easily. 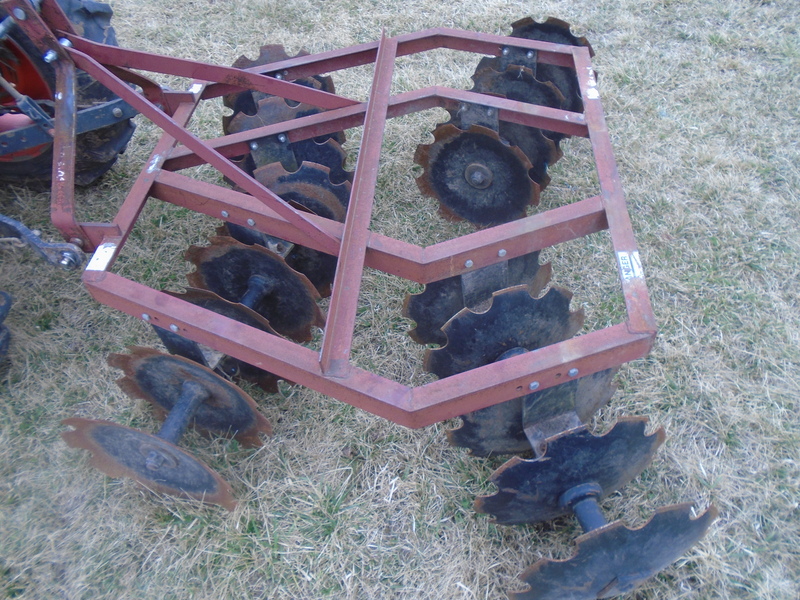 This kind of plow is called a moldboard plow and as it goes it plows the ground and flips the top of the ground over onto its self so any sod on top is buried under soil and then the sod dies out. That’s if you go at the correct speed and as you can see by this photo some of the sod didn’t get turned over. I wasn’t going fast enough there but learned quickly and got better at it as I went. 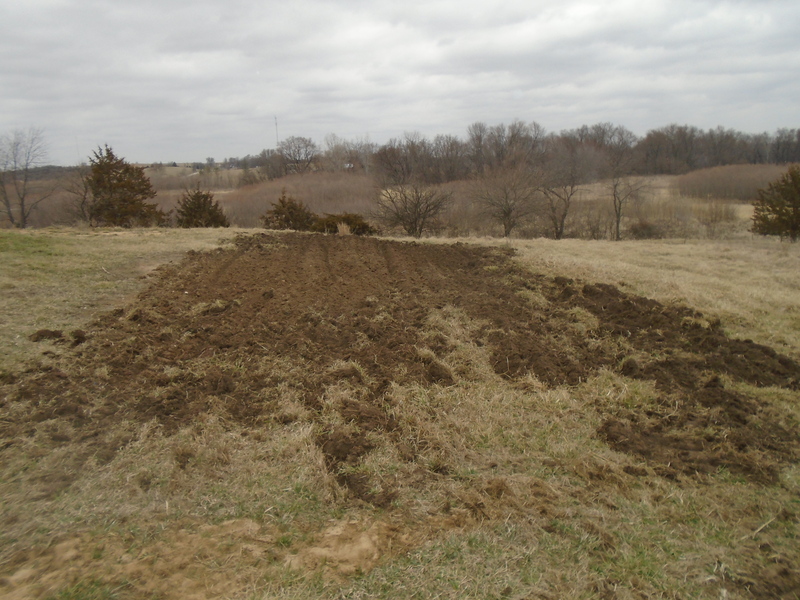 After I got the the area plowed, as you can see by the pictures, the ground is really rough looking. Now you have to smooth it out and break up any dirt clods. That is where the disc comes in. I bought this 6 ft disc just a few days after I bought the plow. You can see by the picture below how the disk is angled to make sure it breaks up all the dirt clods. I went over the ground I plowed 2 or 3 times and I was amazed how well it did. It really smoothed out the ground. 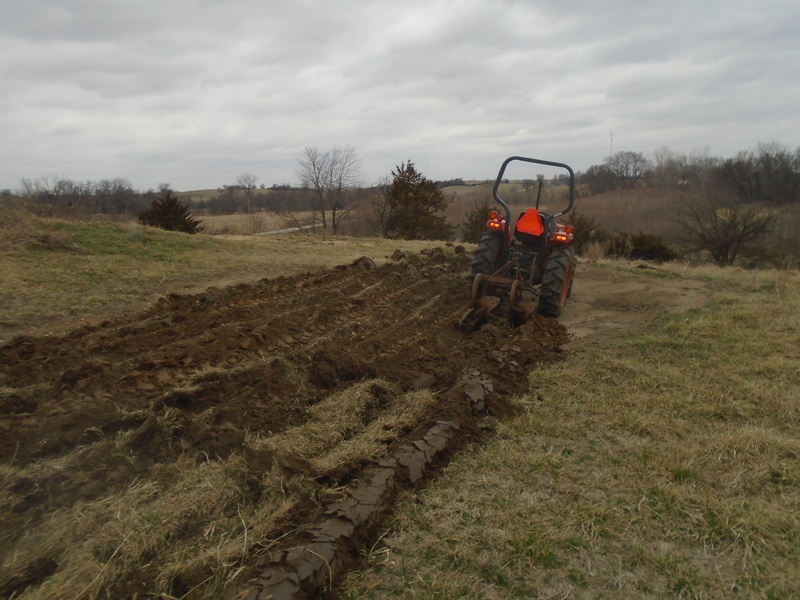 It’s not perfect but it was my first attempt at plowing so I won’t be too critical of my efforts. I know I had fun playing with the tractor and the implements and can’t wait until spring to do some more. What I thought about was how my Grandfather who was a farmer that had a farm by the town of Lacona only about 20 miles from our farm here. 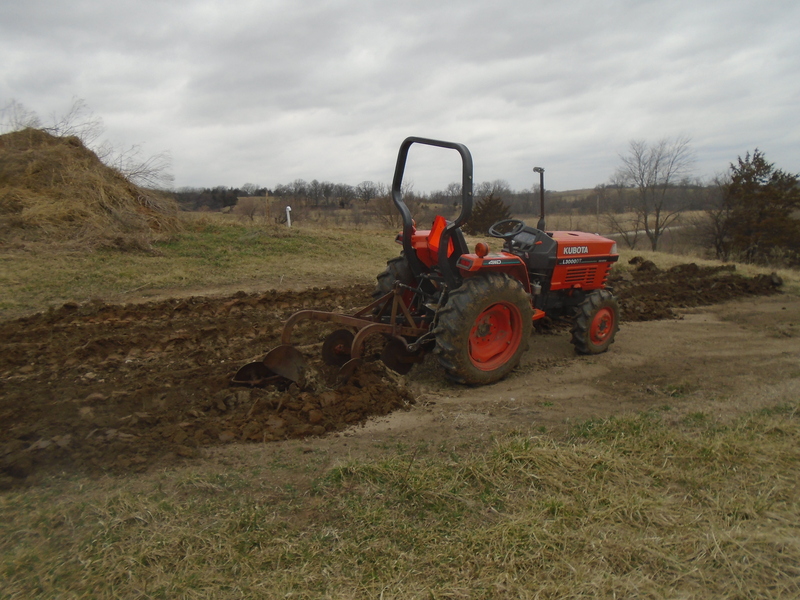 He used to plow with this same type of plow when he went from horse drawn implements to his first tractor early in the 1950’s. He had a 160 acres and I couldn’t imagine doing an 80 acre field with a two bottom plow. Some how doing this has made me feel more connected to my grandfather and more connected to our own land. I am a retired conductor for a commuter railroad in Chicago IL, I now live in and have bought a 40 acre farm in South Central Iowa that I have built from the ground up. My wife and I are trying to raise and grow most of my own food using sustainible and organic methods. I have a blog that journals my journey to becoming a farmer. This entry was posted in Farm Report. Bookmark the permalink. Thanks Tony, it makes sense. I will try that next time I plow. Love it Gordon! Really proud of you and am very glad that you are happily living your dream! Thanks Tammy, I know you were raised on a farm and probably could give me a few pointers too. Wow, Gordon, way to go! You’re a real farmer now. 🙂 And you’ve got yourself a good tractor there! We love our Kubotas! Thanks Susan, its like playing farmer but I am just a wannabe. Those kubotas are good tractors wouldn’t trade mine for a John deer. Don’t ever be stuck for practice areas…. we’ve plenty of plots here that need ploughing…. I enjoy your posts from building your home to plowing a garden. I too am a city boy but was raised on my dad’s farm but when I was ten years old we moved into town, farming is hard and the weather plans a huge part of successful farming. I can’t wait for more of your posts. Thanks for reading my post Dale, nice to know people like to follow along. You used to live on a farm, do you have the dream to go back? If you do I hope you make it back someday its a real blessing to finally to be able to do what you dream about. Even though I’d done it as a kid, I’d been away so long when I came back to the farm that it was like new to me too. I had a heck of a time hooking up implements. I even asked my neighbor, a lifelong farmer, if he hooked them up by himself. It seemed to me that it was a two-man job. He politely told me that he did it by himself and that with time it would come to me. He was right about that. Now I can practically do it in my sleep. I’m sure the same will happen with you. I’m envious of your flat ground and beautiful dark soil. I expect you’re going to have an awesome garden there! Thanks Bill it is tough to hook up a implement for the first time but I know your right about getting better at it over time. When I first tried to hook up our flail mower it took me just about as long but I had gotten faster the more times I did it. I will be looking into those quick hitches to see if that helps a lot.